I’ll start by saying that you would be a brave man/women by picking more than 3 of these guys… but as a wise man once said “Scared is what you’re feeling, but brave is what you’re doing” and in the Fantasy world – Bravery is what is going to get you into that brand new 2.7L Toyota Hilux & give you AFL Fantasy immortality. Every one of these players, for whatever reason have been overlooked by the Fantasy public & quite frankly I am disgusted! All of the players in the Not-So-Hype AFL Fantasy Classic team appear in less than 6% of teams. Matthew Boyd (2.7%) & Kade Simpson (2.8%). Yes I know they’re “old” but they both averaged 102 & 101 in 2016! With the 2 trades a week that we have, even if they miss a game here and there it won’t matter too much, they can always be covered by our bench for a week. They’re absolute rocks & deserve more love. The most underrated player int he competition, Zac Williams (3.6%), is only heading in one direction…. UP! Hamish Hartlett (5.7%) is a fallen premo who averaged 96 in 15′ and is heavily underpriced. Cannon Trent Mckenzie (1%) is also rookie priced and is capable of an 80 avg, and Tom Stewart (5.9%) is turning heads at the Cattery and could be a good shout for Rd 1. Zach Merrett (2.6%) started to grow a tiny pig tail last year, and yet people have discarded him in 2017, but why? IMO he needs to be talked about just as much as Rocky & Danger. His 2% ownership is a slap in the face for someone who averaged a whopping 118 in just his 3rd year of AFL. He is just 21 years of age and IMO is only going to get better with better players around him! Lachie Neale (4.2%) almost picks himself, the man is a ball magnet, and almost depends on feeling the leather to live, just like you and I depend on air. Aaron Hall (0.4%) lead the early stages of the Brownlow medal in 2016, and his Fantasy scores reflected that- averaging 129 in his first month of the season. Sam Mitchell (2.8%) also started 2016 on fire – Averaging 124 in his first 5 games. I just can’t help to think that Sam is going to replicate that this year in a team who wants, actually sorry – NEEDS to give him the ball. Liam Shiels (0.7%) at D5- don’t laugh. With Mitchell & Lewis both gone, & Hodgey not getting any younger. Someone has to take that midfield time. We forget just how good he has been in the past, he has averaged 99 & 103 at his time in the brown and gold, and priced at an average of 81, He could just be the best POD of 2017. Jack Trengove (2.5%), how the footy world just want to see this man hit his potential. He averaged 90 in just his second year of AFL, before injuries and unfortunate events have seen him plateau out. He had played only 5 games in the last 2 years, but 2017 could finally be the year where everything falls in his favour, fingers crossed! Sam Petrevski-Seton (5.4%) recently received the #5 for the blues. You don’t receive that number if the club doesn’t believe in you. He is the most skilled young player of the 2016 draft, he could hit a target with both feet even if blindfolded, spun around 15 times, and made to finish a slab of froths. He also has more evasive skills than a deer does when running away from a pack of hungry lions. I would even go as far as saying that he could become Bruce Mcavaney’s new love child! From all reports, he is absolutely lighting up training and could be a show for RD 1. Last week, Leppa came out and told the public that Shai Bolton (5.1%)is one to watch for all the #supercoach & #AFLFantasy players out there, so he is also in! Sam Jacobs (4.4%) simply underpriced and with the no third man up anymore, will benefit with a couple of extra points! Sauce can comfortably average 95 and even push for more. He is the #1 ruckman at the crows and it doesn’t look like that will change! Jarrod Witts (3.5%) – a new team and hopefully new opportunity. Fighting for that #1 ruck role, which if he gets, will be an absolute steal- priced at an average of 54, will surely surpass that in 2017! I’m not expecting huge scores, but could be a great cash grab! 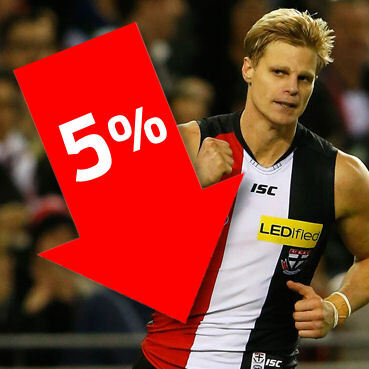 Nick Riewoldt (5.1%)… ROO!!! He just can’t.be.stopped. Is he expensive? Yep! Is he going to be the top scoring forward again? YEP! So what’s not to like? To the 1883 people who have selected Saint Nick, I take my hat off to you. Only 5% ownership is an absolute crime for a bloke who has a ceiling of 200!!!! Stephen Motlop (1.5%) we all remember that photo of him in 2016 when he looked like he had been to every Christmas Lunch in the country. But not this year, he has been in terrific pre season form and spending some added time through the guts. Capable of anything, Motlop can average upwards of 90, and with the lack of genuine forwards this year, why not? JB…. no not Justin Bieber, Jack Billings (2.6%)!! Definitely one to watch this year. Mark my words. Everyone in the Red, White and Black are saying ” watch out “. Approaching 50 games, this could be his big breakout year. Has been doing a lot of work in the guts this pre-season, and could be a great POD in the FWD line. Sam Reid (0.6%), the swan missed all of 2016 through injury ( must be a Reid thing ) but in the last 4 games before finals in 15′ averaged 101… with that potential & basically rookie priced, why not? Matt White (2%), remember him? Absolute basement price for someone of his calibre. Never been known as a great Fantasy player but he is a vital cog in Port’s team. With speed and pace to burn, and only priced at $284k, he can sit comfortably in your team. Both Reid & White’s job security is fantastic, so you can feel safe when slotting them into your forward line! Ben McKay (0.5%), Who you ask? Just the 200cm athletic machine down at Arden St! Impressed in the intra-club with 3 goals, with no Petrie and Jawaite likely to be injured… he could be a sneaky chance for RD 1 debut. Thanks to The Wiz for this cracking article. Follow @TheWizDT on Twitter. Billings is in my side and witts is very tempting. Originally I had grundy and stef but in my heart I don’t think I can trust stef. If he goes crap he could drop to the same price witts rises too! Not a bad looking side given it’s all PODs, definitely gives a few options to look at. Why is there no hype around Dustin Martin, he’s a proven fantasy gun !!! Because for the first time in years he is a Mid only. Picking him to be a certain top 6 fwd was easy, however when Pendles, Hanners, Titch and cheaper guys like Fyfe, Heppell and Beams are there to be chosen over him, the decision to start with him is harder. Dustys round 1 average score for the past 7 seasons is 72.2, Round 2 his ownership might pick up! hmm. out of that side I’ve 3. Shiels Bolton and Stewart. Great stuff Wiz. Less than 6% ownership for NRoo is an absolute crime, but I don’t care, I’ll just lock him in and watch him smash it. Anyone keen to join my league? Preferably port fans but a bit of rivalry wouldn’t hurt. Thanks code: 6PY7YCAD.